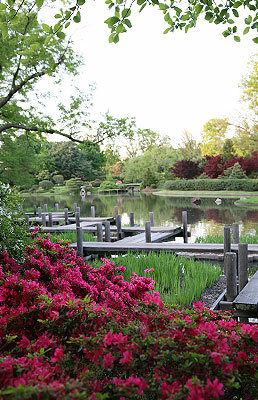 Overlooking a serene 4 ½ acre lake with a footbridge, the Japanese Garden is one of the most photographed locations in the Garden. With the rental of Japanese Garden, you are guaranteed an indoor ceremony site in inclement weather and a wedding assistant from Catering St. Louis who will be present for your rehearsal and your wedding ceremony. Depending on the previous and current weather conditions, the Garden reserves the right to make the decision whether the ceremony will take place in the Japanese Garden. Price includes capacity chairs. Chair removal may require a fee.